Sign #3242953 that baking is taking over my life: it's 11 pm on a Wednesday. I want a cookie. No, scratch that, I need a cookie. While my former self would have languished in disappointment that I was not in possession of anything resembling a cookie, present-day Amy hopped off the couch and stormed the kitchen on a mission. A cookie mission. I decided on these peanut butter cookies simply because I had all of the ingredients on hand. And, as a bonus, this was my first time making traditional, crisscross-y PB cookies. I never quite grasped how fun--and cathartic-- it is to make that crisscross with a fork until I got to do it 2 dozen times. That night, I not only got my cookie (or 24), but I now have a new cookie recipe in my pocket. Crisis averted! 1. Adjust the oven racks to the upper-middle and lower-middle positions and preheat oven to 350. Line 2 large baking sheets with parchment paper. Whisk together flour, salt, baking soda, and baking powder in a medium bowl. 2. In a large bowl, beat the butter and sugars together with an electric mixer on medium speed until light and fluffy, 3 to 6 minutes. Beat in the peanut butter until fully incorporated, about 30 seconds. Beat in the vanilla, then the eggs, one at a time, until combined, about 30 seconds, scraping down the bowl and beaters as needed. 3. Reduce the mixer speed to low and slowly add the flour mixture until combined, about 30 seconds. Mix in the chopped peanuts until just incorporated. 4. Working with 3 tablespoons of dough at a time, roll the dough into balls and lay them on the prepared baking sheets, spaced about 2 inches apart. Make a crosshatch design on each cookie with a fork, dipping the fork in water after you do each cookie to prevent sticking. 5. Bake the cookies until the edges are golden and the centers have puffed and are beginning to deflate, 10-12 minutes, switching and rotating the baking sheets halfway through baking. 6. Let the cookies cool on the baking sheets for 10 minutes, then serve warm or transfer to a wire rack and let cool completely. Ha ha! I do that all the time. I'll be sitting on the couch, and all of a sudden I'll be like -- I want to bake something. My boyfriend doesn't even try to talk me out of it anymore... he just tries to sway me to bake something he likes. Ha ha. 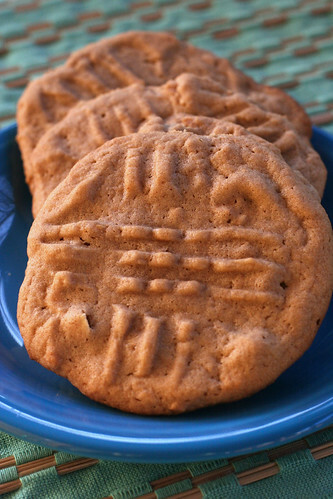 I feel like there is really no problem in the world that a peanut butter cookie can't solve. ahhhh~comfort food at it's best! i feel as if i could reach out and grab a PB cookie from your photo as a treat for studying...if only! The criss-crosses on pb cookies always makes me happy! These look and sound perfect!